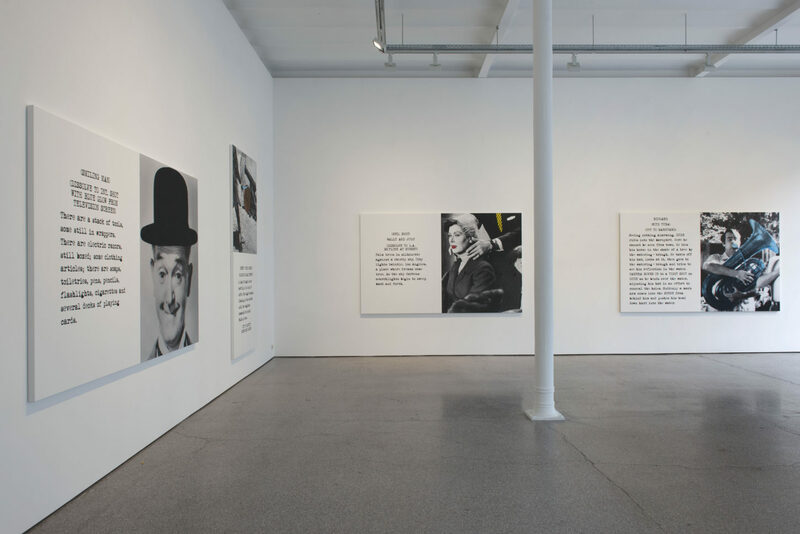 Greta Meert gallery has great pleasure in presenting John Baldessari’s seventh solo exhibition. 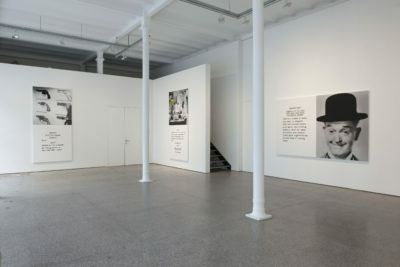 It is the seventh solo exhibition of the artist at the gallery. 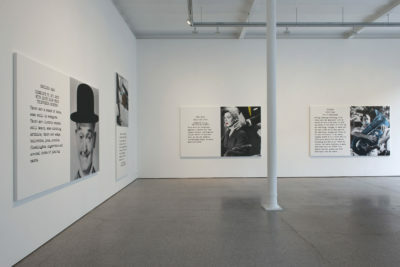 John Baldessari has been recognised worldwide as one of the most prominent contemporary artists. For over five decades he has been developing a conceptual oeuvre that touches on pop art and appropriation art, in a sustained attempt at reinventing himself as an artist. 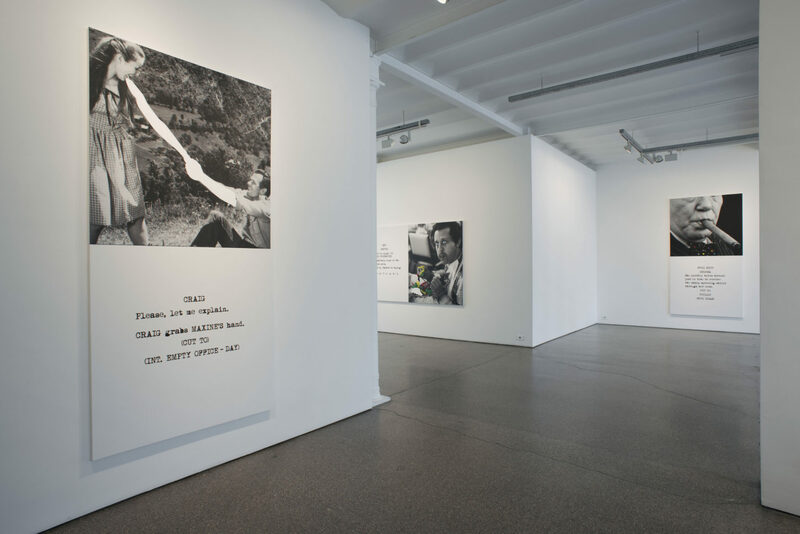 Baldessari played a pioneering role in the use of ‘found footage’ and the combination and exchangeability of text and image in visual art. An intense interest in linguistic theory and psychology of the image form the basis of his penetrating analyses of the meaning, perception and interpretation of the image, and by extension, of the work of art. The latest series, Scene ( ) / Take ( ) draws from an imaginary film archive that ranges from the American film noir, through slapstick to European director’s films. 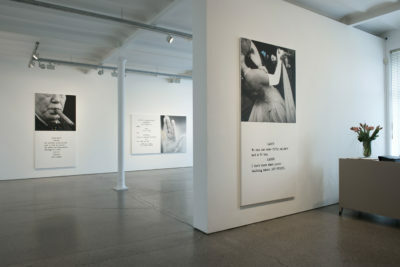 Each of the fifteen works on show is a juxtaposed composition of a black and white still and a fragment of a film script. Selecting, editing and fragmenting are crucial in the composition of these images. The symmetrical organisation of the picture plane allots equal space to the textual and the visual components. They relate to each other in an ironical, sometimes contradictory or subversive manner. In a final stage, the artist uses paint to apply colour accents on the canvas. In Baldessari’s work colour is not gratuitous, but it often has a symbolic value (red/dangerous, green/safe, blue/platonic, yellow/crazy). The associative structure of meaning, with its numerous layers, results in multiple interpretability. The brackets of Take and Scene remain empty. The double meaning of the French term “cliché” perfectly suits Baldessari’s work: a photographic image and a phrase that has been used so often that it has lost its originality. 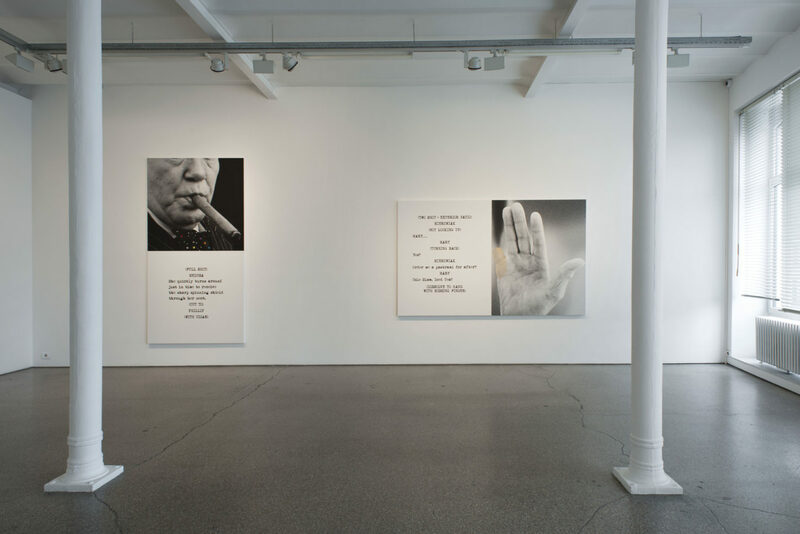 Baldessari plays with this form of familiarity that he always tries to destabilise. John Baldessari (1931, National City, California) lives and works in Santa Monica, California. 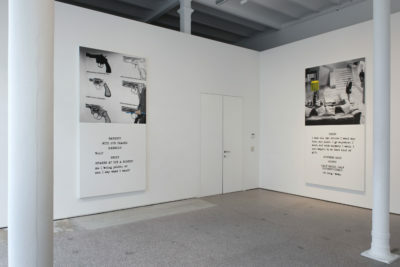 His work was selected for the 47th (1997) and 53rd (2009) Venice Biennial , for the Carnegie International (1985-1986), the Whitney Biennial (1983) and Documenta V (1972) and VII (1982). 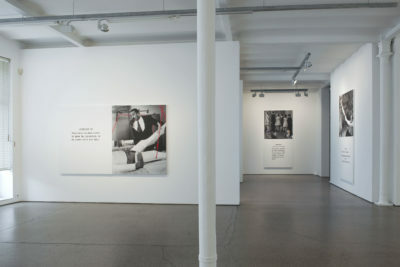 In 2005 a major retrospective exhibition was organised by the Museum Moderner Kunst Stiftung Ludwig, Vienna and the Kunsthaus, Graz. 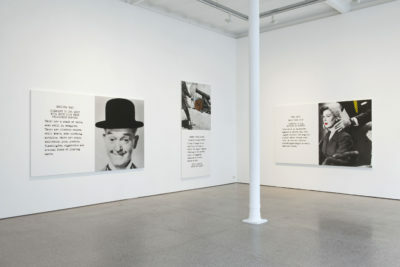 In 2009 the large exhibition, “Pure Beauty” opened in the Tate Modern, London and travelled to MACBA, Barcelona (2010), LACMA, Los Angeles (2010) and the Metropolitan Museum of Art, New York (2010/2011). 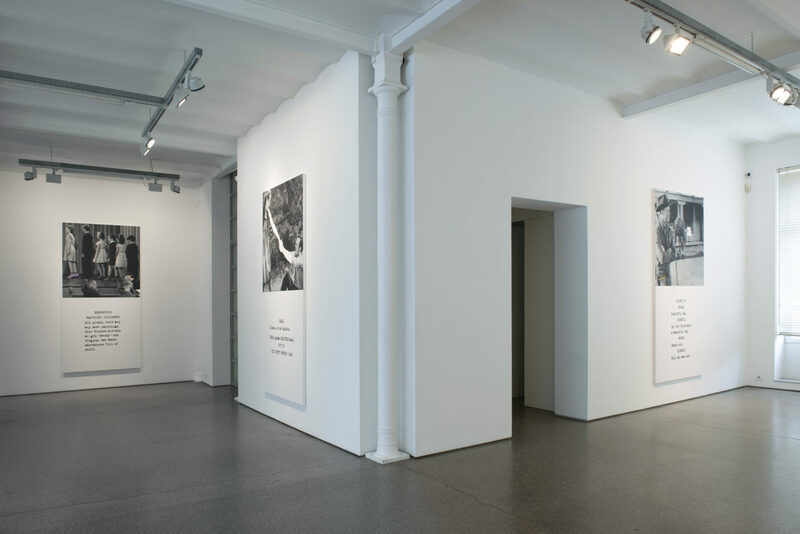 Recent exhibitions were organised by Fondazione Prada, Milan (2010), the Stedelijk Museum, Amsterdam (2011), and the Garage Center for Contemporary Culture, Moscow (2013).